Traditional braces can be a real pain in the mouth. Prickly wires and other unsightly metal can be a drag. This is where Invisalign comes in – it’s the preferred way to straighten teeth by both adults and teens. The best part about it is people won’t even know you’re straightening your teeth! We offer this and other fantastic dentistry services that aim to keep your smile beautiful. Southlake, TX dentist, Dr. Preetha Thomas, and her team will ensure you’re well educated on Invisalign technology that is becoming more popular by the day. We weren’t all born with perfect teeth. There are those lucky few who have beautiful teeth having never received any dental correction techniques. For others, there’s always been braces. 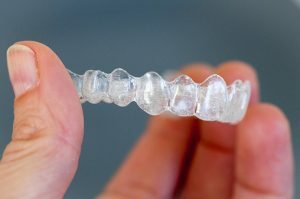 Luckily, there’s a sleek alternative that has turned the orthodontic world upside down: Invisalign. It takes a modern approach to straightening teeth, using a custom-made series of aligners created for you and only you. Wearing the aligners will gradually and gently shift your teeth into place, based on the exact movements that are planned by our team of experts. The best part about the whole process is that most people won’t even know you’re straightening your teeth. Clear braces are the way of the future! Invisalign in Southlake has taken over! With regular braces, you may experience some or all of the following: pain, discomfort, mouth sores or injuries caused by the brace wires, tooth decay (from inadequate brushing and flossing), plaque buildup, tooth discoloration, tooth/bracket breakage, and more. Plus, there are also the personal food sacrifices —popcorn, chips, bagels, hard-crusted bread, pizza crust, pretzels, nuts, carrots, corn on the cob, and more. With Invisalign, you can enjoy all of the food you crave without sacrificing improvement. So, would you rather deal with metal and prickly wires, or straighten you teeth invisibly while enjoying your favorite foods? The choice is clear. Your teeth deserve the best and most discreet treatment, and you’ll receive that with Invisalign braces. We are your Invisalign providers and will work with you to ensure your teeth-straightening treatment goes off without a hitch. To learn more about the advantages of Invisalign or to schedule your appointment, speak with our friendly staff in Southlake, TX. We also proudly serve our neighbors located in Grapevine, Westlake, Colleyville, Euless, Dallas and beyond.